Yes, everything in good focus with no compromise, guide camera focused on slit, telescope focused to give a nice star image in the guide camera, and neon lines focused. Just to emphasize this was with a different grating, the 600 l/mm grating. When I switched back to the 2400 l/mm grating the image was back to a vertically broad spectrum with everything else in focus. AndyWilson wrote: I have tried to loosen the grating holder for my 2400 l/mm grating, but no matter how hard I try I cannot loosen the screws and I risk damaging something. I agree with Robin, too tight. Just one touch is enough. Andy, for your spectrum with the grating 600, the intensity is supperior on the top of the spectrum. I noticed this also when my telescope is not well collimated. By very careful measurement of collimator to slit and collimator to sensor distances, I was able to ascertain that my original camera adapter was too long. I’ve since addressed this, and it has helped. Needless to say, the relationship between these distances is an important factor in the ‘visual appearance’ of spectral and guide images in the Littrow design. I too found my grating clamps to be somewhat ‘distorted’ with my original shipped Lhires, and have since shimmed them to improve the feel and adjustment of the grating in its holder. I did find that collimation of my RC helped bring the focused guide image closer to that of best spectral image focus. It’s no surprise that a distorted telescope image can lead to errors in what we’re seeing (or at least make it very difficult to ascertain correct focus). I say this because I note that you also use an RC. I find that my collimator is quite loose in the holder - and that focusing the collimator can see things ‘move around’ quite a bit. 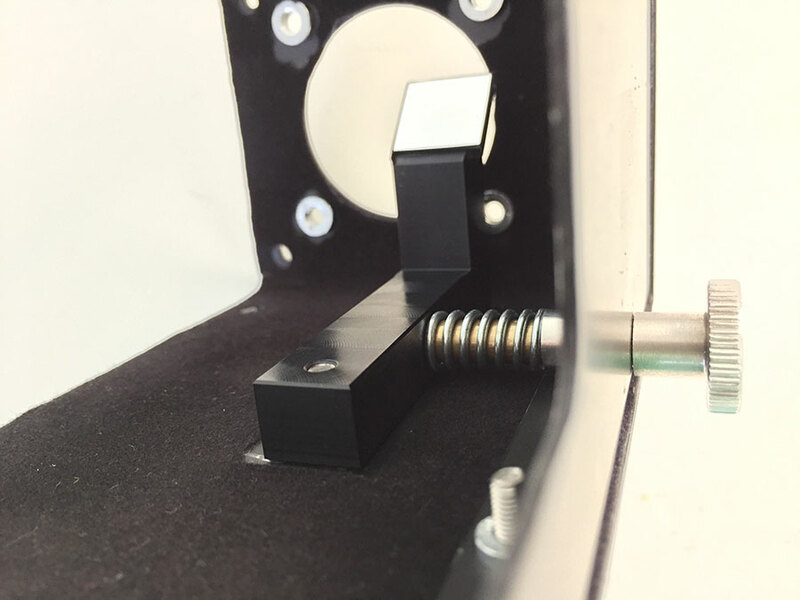 To that end, I take considerable care in operation of the nylon screws that secure the collimator’s focus - and make sure that my 'focusing technique’ is as consistent and repeatable as possible. Even then, I still see movement. When evaluating focus (i.e., “tightness”) of the spectral image, I’ve found it necessary to mentally average several exposures - particularly if you’re using a bright target and short exposures under poor seeing. I note that the ‘thinness’ of my spectral image changes substantially between single exposures, and this can lead to incorrect assumptions about the focus of the target on the slit. To that end, assuming my collimator to slit and collimator to sensor distances are correct, I always start with a focused star image on the slit, and work from there. Having said that, I’ve seen comments (including a post from Valerie some time ago) that it is not exceptional to have the guide star slightly de-focussed in order to achieve the best spectral image. Correlation between the two, it seems, has been discussed by others before and idiosyncrasies are not necessarily unheard of. Discussions I’ve had with François at Shelyak lead me to believe that much of the residual effect is astigmatism related. We do the best we can with a design that includes this significant ‘feature’. In the end, the quality of spectral profiles is the ultimate judge - so I try to ignore the residual optical effects in favour of acquiring data if all seems to be working nominally. If I think of anything more I’ll let you know - but please keep us in the loop with your findings. I've looked at all your messages. I think that you all already pointed out the different potential causes. It looks you've an astigmatism issue, I confirm : depending on the focusing position, the star image is either vertical or horizontal. This is why star spectrum (horizontal) and Neon spectrum (vertical) are not fcused at same position. This astigmatism is inherent of the Lhires III, because we're working in a 3D scheme - it is perfectly shown by the calculation (see Christian Buil's pages, as mentionned by Robin, I think). When the Lhires III is properly tuned, the astigmatism is minimal, and is almost not visible. This is not your case, for sure. - if the acquisition camera adapter has not the right thickness ; then, the distances slit/collimator and CCD/collimator are not the same. - working with "high" off-axis angles (astigmatism appears when you work out of the optical axis). This can happen for instance if the grating os rotated on its holder (rotation in the plane of the grating surface). This may make the off-axis angle higher than nominal. If you're in this case, you may be at (close to) maximum position of the main mirror tuning (to compensate the off-axis). Not sure I'm clear... tell me. - grating surface deformation (not flat enough). It can happen if there is some dust between grating and holder. We've seen that sometime (not often). In the first generation of Lhires III, the grating was glued on the holder, and lot of people had problem with temperature changes- this is now totally solved (grating are not glued anymore for a long time). It is also possible that you've a combination of these phenomena. My feeling tells me that you should look at the grating first (not flat surface), because this is the most important effect - and your effect seems important. The best way to further investigate is to change some parts ; grating (as you did with the 600l/mm), or use a hole instead of the slit (a very efficient way to see the astigmatism effect). Of course, you must first tune as much as possible the instrument ; but it looks you didi it already (many times !). I think it will be useful to send you some of the above pare parts, to make the exchange and see what happens. We see the details by mail (francois.cochard@shelyak.com) ? Sure we'll find the bug ! Thank you for your detailed reply. I think I may have just identified the main problem, which was the grating clamp was too tight and giving a slight deformation to the grating. This combined with my misunderstanding of which screws loosen to adjust the pressure holding the grating in place. I had been trying to adjust the end screws on the grating, which would not budge, rather than the centre screws. In Olivier's personal email to me today he mentioned springs to free the grating which made me realise my mistake. I attach a photo for reference for all to show the screws I've just adjusted. Backing these out allowed me to move the grating, I then retightened them to hold the grating gently (after my experiment I've tightened them a little more to make sure the grating is secure). Grating holder with arrows pointing to the screws I adjusted. Unfortunately cloud rolled in earlier than scheduled, so I had to make a very rushed job of taking a spectrum without correctly fine tuning everything. I had no time to adjust the neon and telescope focus, but both appeared to be roughly in focus, and I managed 3 short 10 second exposures of Betelgeuse before thick cloud came over (I chose a bright star to have a chance of getting a quick spectrum). As can be seen the spectrum is still not perfect, but this already looks better than the spectra I was getting before, and this is not surprising as the focus is unlikely to be accurate. When it is clear again I shall carry out a more thorough test taking care to focus everything properly. Roughly focused spectrum with 2400 l/mm grating. I'll only be able to tell if I've properly solved the problem when I get clear skies again. However, this quick result gives me confidence that at the very least the main problem is now identified. Thanks to everyone for their help and advice. I'll post a further update when I can run a thorough test. Sounds promising Andy. In my mind, and François and others can correct me if I'm wrong, correct orientation of the grating in its holder is indicated by a spectral image staying centred on the ccd over the travel of the micrometer (from zero order all the way into the red). It surprises me that your grating was over tightened, and I still wonder if your slit to collimator and collimator to sensor distances are exactly the same. I'm going to take a look at my Lhires' "current state" over the next couple of nights. There's the promise of clear weather, and I have some spectra of WR6 et. al to collect for the Brite campaign. I'll let you know if anything obvious turns up as I'm back at the instrument again - and might post an image or two to compare our systems. I'm finding this troubleshooting and analysis exercise very interesting and helpful. This is a good news if you've found the root cause. Tell us if it is confirmed when everything is tuned (we still see that your spectrum is quite wide). Paul, I agree with you : moving along the visible range with the micrometer is a good way to see if the grating is well positionned (when the grating lines are parallel to the grating rotation axis, there is no lateral movement of the spectrum). By the way, the best way to check if the camera adapter has the proper length, is to focus the slit with an external camera (DSLR, for instance), with the grating holder removed, and see if the spectrum is focused or not when remounting the grating. As far as I remember, the tolerance for the adapter is about 2mm. Above this value, we start seeing optical aberrations. Let's wait for Andy's validation. A clear night tonight so I've been able to spend time focusing the collimator lens and telescope following my adjustment to the grating holder a couple of days ago. The results are a huge improvement over anything I've been able to achieve before. Below is the best spectrum I attained. Most of the time I had a slightly broader spectrum, as per the second example below, but I put this down to my experience and probably changes in telescope focus due to temperature shift. The guider image also looks very good, as per the final image below. In addition to the above visual impression of the spectrum, I found I needed shorter exposure times. I had to cut the exposure time in half for a star I frequently observe as I had reached the non-linear range of the CCD. Also, there had previously been a very slight asymmetry to the neon lines which has now gone. Both good indications that the spectrograph is now working well. Sounds like a great outcome!